The iron ore producer's third-quarter results might have received some more attention were it not for Lourenco Goncalves' conference call comments. Cleveland-Cliffs' (NYSE:CLF) most recent earnings results and conference call got a lot of extra attention this past quarter, but not for the reasons investors might have hoped. 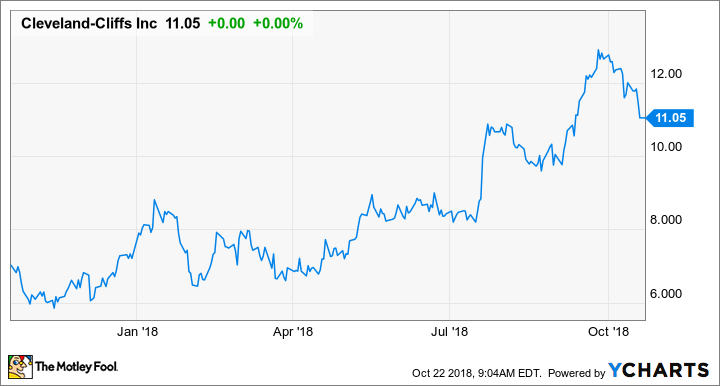 Even though the company posted another great quarter that absolutely crushed estimates and finally restored its dividend, the attention was on CEO Lourenco Goncalves going off-script with some derogatory remarks about analysts and short-sellers of the company's stock. While I don't doubt that Goncalves' remarks will make some investors sour on the stock, the things that happened in the third quarter strengthen the case for Cleveland-Cliffs' stock. Let's take a look at the numbers to see what happened this past quarter and why this stock looks so attractive right now. DATA SOURCE: CLEVELAND-CLIFFS EARNINGS RELEASE. EPS= EARNINGS PER SHARE. Cleveland-Cliffs benefited from the previously announced sale of its Asia-Pacific iron ore operations, which resulted in a one-time gain of $230 million from its discontinued operations. Absent that gain, though, the iron ore producer still posted a $0.67-per-share earnings result from its continuing operations, which beat analyst expectations. Also, after the end of the quarter, management announced that it had redeemed all of its outstanding 2020 senior notes. Eliminating the $211 million in debt will bring Cleveland-Cliffs' total debt down to $2.1 billion and will reduce interest expenses by $10 million annually. With that debt reduction, credit ratings agency Moody's upgraded Cliffs' debt for the second time this year. With its iron ore operations generating sufficient cash flows, a lower debt load, and its capital expenditures for its new hot briquetted iron upgrading facility falling into place, management determined that it was now in a position to reinstate its dividend that was cut back in 2014. The $0.20 annualized dividend equates to a yield of 1.8%. On top of molding this business into a predictable and consistent cash flow generator, we have also made it far enough along in the HBI project. And at this point, any risk of a major cost overrun has been eliminated. With our balance sheet in good order, we have pressure-tested our free cash flow using a number of bearish assumptions and came to the conclusion that we are comfortable paying a dividend at the $0.20 per year level at any point in the cycle. Doing a back-of-the-napkin calculation, a $0.20-per-share dividend equates to about $59 million in annual cash outlays and an earnings payout ratio in the 10%-15% range based on trailing-12-month earnings from continuing operations. Keep in mind, though, that there have been a lot of one-time credits and charges over the past year, so that earnings number is a little skewed from what we can expect going forward. This isn't the first time that Goncalves has made some harsh remarks on a conference call. For the past couple of years, he has been less than kind to analysts about their view of the business. It's a shame that those comments are overshadowing what was another fantastic quarter complete with solid earnings results, lower debt levels, and progress on the company's major capital project. Also, based on CFO Tim Flanagan's guidance for sales, we should expect an even better fourth quarter. Hopefully, not too many investors were turned off by Goncalves' behavior on the most recent call, because Cleveland-Cliffs still looks like an incredibly undervalued stock. The case that it is undervalued was made even stronger by this announcement of a dividend, as it shows management has enough confidence in its operations and its balance sheet to start giving back cash to investors.